Slovenia has introduced a motorway vignette for vehicles with vehicle height above front axis 1.30 m or more. In Slovenia a special motorway vignette is required for the vehicles with a height above front axis of 1.30 m or more and mass not exceeding 3.500 kn in the amount of EUR 30.00 for a weekly vignette. By car from Trieste (Italy): Pasjak-Opatija border crossing – Brestova ferry port – ferry to Porozina – islands of Cres and Lošinj. By car from Ljubljana (Slovenia): Rupa-Rijeka border crossing – island of Krk (crossing the bridge) – Valbiska ferry port – ferry to Merag – islands of Cres and Lošinj; it is also possible via the Rupa-Rijeka border crossing – Opatija – Brestova ferry port – ferry to Porozina – islands of Cres and Lošinj. Croatia is connected with Slovenia, Hungary, Italy, Germany, France, Slovakia, Bosnia and Herzegovina and other countries by international bus routes. Regular passenger and ferry services between Italian and Croatian ports are available all year. There are direct catamaran routes between Mali Lošinj and Pesaro, Cesenatico, Rimini and Venice during the season. Regular passenger and ferry services are available between Italian (Venice, Trieste, Ancona, Pescara and Bari) and Croatian ports. A railway network connects Croatian with Slovenia, Hungary, Germany, France and Bosnia and Herzegovina. There are indirect routes for all other European countries. 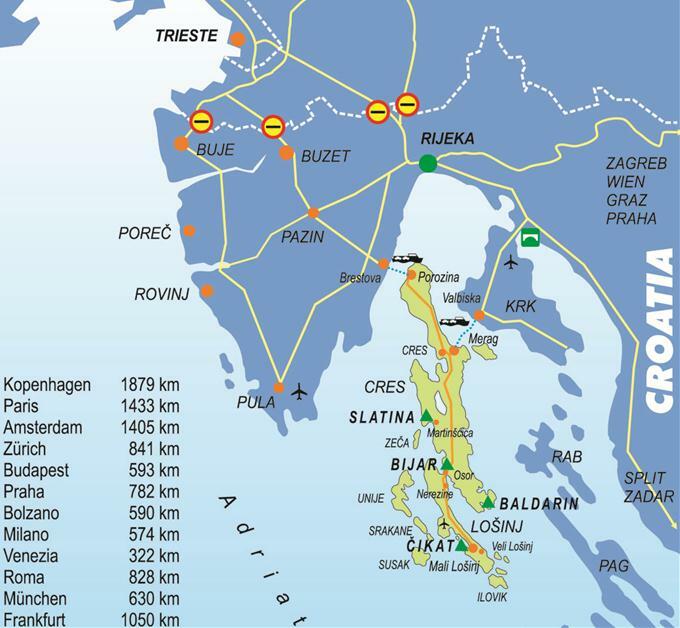 The railway network also connects all major Croatian cities except for Dubrovnik.